Blood glucose level is the amount of glucose present in the blood. 2 very common ways in which blood glucose is measured is in mmol/L or in mg/dL. Depending on the country, these differing units for blood glucose are used. 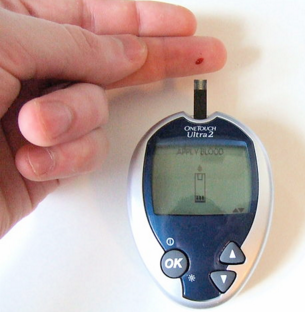 Today, it is not uncommon for glucometers to have the blood glucose reading in both units. However, there still exist many glucometers which only give the blood glucose reading in one unit. In those cases, it is necessary to perform conversion. This calculator can convert from mmol/L to mg/dL or from mg/dL to mmol/L. To convert from mmol/L to mg/dL, we multiply the unit mmol/L by 18 to get the equivalent blood glucose reading in mg/dL. Thus, for example, a blood glucose of 15 mmol/L is equivalent to a blood glucose of 270 mg/dL, since 15 *18=270. To convert from mg/dL to mmol/L, we divide the unit mg/dL value by 18 or multiply it by 0.55 (since 1/18=0.55). Thus, for example, a blood glucose of 900mg/dL is equivalent to a blood glucose of 50 mmol/L, since 900/18=50. So, again, both values measure blood glucose the exact same way, just in different measurements. To use this calculator, simply select the option that you are entering into the text box. So if you want to convert from mg/dL to mmol/L, you would choose mg/dL on the select option box. If you want to convert from mmol/L to mg/dL, you would choose mmol/L on the select option box. In the United States, mg/dL is the most common type of measurement for blood glucose. But in countries such as Canada, mmol/L is more popular. Mg/dL is preferred in the United States, France, Japan, Israel, Italy, Mexico, Korea, and Inida. Mmol/L is preferred in Canada, Australia, Russia, China, Ireland, New Zealand, and the United Kingdom. Germany is the only country where healthcare professionals regularly operate in both units of measure. For a more in-depth look at unit of blood sugar measurement by country, see the following chart below. It's interesting to see how so many countries follow different units of measurement for blood sugar, without seemingly much of a pattern. If you are a healthcare worker who will be working internationally, it's best to be familar with with blood sugar in both mg/dL and mmol/L.